Known as one of the fastest half marathons in the country and voted the number one race for beginners in 2011 by Runner’s World magazine, I had high hopes for this year’s Mizuno Reading Half Marathon. As I’d already run the distance a couple of times I was confident signing up for the event with only just over a month to go. 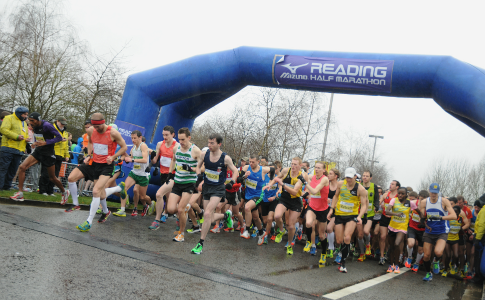 However, this is the luxury of having a media spot in the race – the Reading Half is very popular and spots fill up quite quickly, so if you are tempted to give it a go in the future I’d advise to get your entry in as early as possible! An early entry also puts you in the right mindset for your training. I only had a month to dedicate some serious time to pounding the pavements, so wasn’t sure how I’d do come race day. 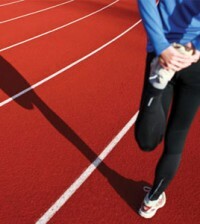 I prefer to try and follow a training plan (like this one!) before taking part in an event as it helps me to gradually work towards my target. 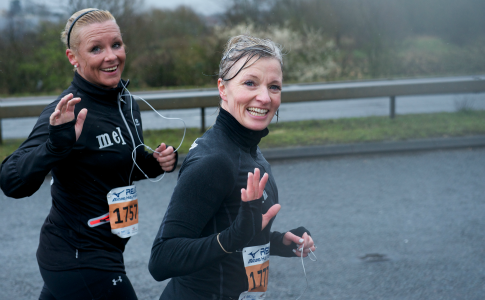 Event organisers Sweatshop partnered up with Full Potential, one of the UK’s leading training providers, for this event to provide four training plans depending on your target finish time, which were really handy too. Before race day I received my runner’s pack including my race number and an info booklet. All the details I needed were either there or available online, so the only thing I needed to worry about was actually running the race! I used one of the pre-booked car parks on offer, which I would definitely recommend, although there were also buses on offer taking people to and from the race start and finish in Green Park. 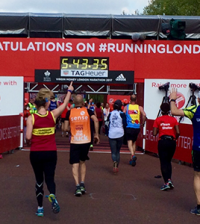 The course was the same as in 2012 and took runners through Reading town centre, weaving its way from Green Park, through the grounds of Reading University and finishing inside Reading Football Club’s 25,000 seater Madejski Stadium. I was expecting the route to be quite flat, which it largely is, though there are a couple of good hills in there to keep you on your toes! On the whole I really enjoyed the course. The support was great, particularly given the weather conditions which varied from rain, to sleet, back to rain, and then back to sleet again, and there were even a few bands playing music scattered along the course. There was plenty of space for runners to spread out which made it easier to find a pace and stick to it and there were ample hydration stops along the way (four water stations at miles 3, 6.5, 7.5 and 11 and two Lucozade Sport fuel stations at 4.2 and 8.5 miles to be exact). One of my big bugbears at events is the amount of wastage that comes from hydration stations. Not only is providing runners with full-sized bottles of drink each time just too much, people rarely take more than a few sips, but it’s also quite dangerous having almost full plastic bottles scattered over the floor. However, I was pleased to see the Reading Half use sachets of water rather than bottles. This meant if runners didn’t take on all the water the remainder would just burst open if trodden on, which is a lot safer than treading on a full bottle! However, there were still full-sized bottles of Lucozade on offer, which posed the same problem. On the subject of hydration and hills, I even spotted a pub handing out small cups of beer at the bottom of an incline, for which I saw a couple of runners run past, do a double take, and then quickly run back in the opposite direction to grab a quick tipple before continuing on their way! There’s news that Foster’s Radler is to become the “official beer” of the Brighton Marathon, so perhaps this isn’t as odd as it might sound! As this race kicked off the UK Athletics runbritain Grand Prix, as well as the English Half Marathon Championships, I was a bit wary that I would find the pace too hot as elite runners chased course records. But this wasn’t a problem at all, and it actually provided a nice competitive buzz. I also really appreciated the fact that, as well as markers at each mile (except mile 12, which was odd, unless I just missed it! ), there were also signs indicating 5k, 10k, 15k and 20k. As I usually run in kilometres rather than miles this was a pleasant surprise to see on a half marathon distance. The only real downside of the course for me was the final stretch which took runners along the A33 dual carriageway for over a mile towards the Madejski Stadium. In other conditions, this may not have been too bad, but at this stage I was tired and very cold and running along an open dual carriageway with the sleet lashing down was not the best fun, particularly as this was the one part of the route that didn’t really have that many supporters. But running into the Madejski was a bit of a goosebumps moment, and not just because it was so cold! I left my bag with a friend, so can’t unfortunately comment on the bag storage, however I have read a few posts on forums from people who said they returned to a soaked bag thanks to the kit tents flooding. On the whole, very well. 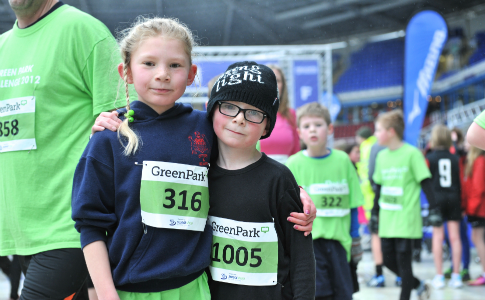 The event was well organised and had a nice family feel to it thanks to the Green Park Challenge, a 2.8km run open to all the family, that took place before the half marathon. The weather unfortunately did put some runners off taking part, and out of the 20,000 runners entered only 14,378 ran the race. Kenyan Emily Biwott was the first woman to complete the 13.1 miles, in 72:14, followed by fellow-countrywoman Polline Wanjiku and then Ireland’s Maria Mccambridge. Tish Jones, crossing the line in 76:36, finished first in the Women’s English Half Marathon Championships. I was impressed with the goodie bag at the end too – a Twix is definitely the right way to end a race! Plus all finishers got a nice medal too. Possibly. It would be nice to run the course in slightly better conditions to make the most of the route and see if I can take further advantage of it’s ‘fast’ nature. – Ample hydration stops with sachets of water instead of bottles! – I know it’s unfortunately out of the organisers hands, but the weather!